Join millions of people who use Camera ZOOM FX to make your own stunning photos! v6 now includes full manual DSLR controls! 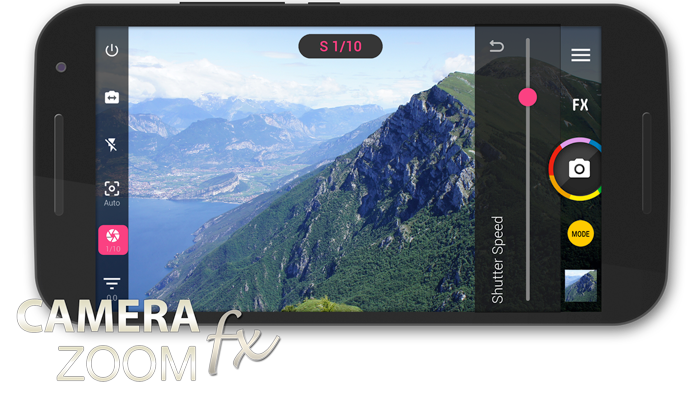 Packed with features that your standard camera app doesn’t include, your photos will improve the instant you start using Camera ZOOM FX. With our mutliple award winning camera app, the only limit is your imagination and creativity! Up to 50 shots per second. Capture action shots at breakneck speed, perfect for capturing kids, pets or even your golf swing frame by frame! Exposure compensation, ISO, focus mode, white balance, shutter speed, focus distance and more at your fingertips! Capture self portraits using our customizable timer, create stunning collages, use HDR mode or even create time lapse photo sequences. Use our Image Stabilizer to capture at just the right moment. The on-screen monitor will show you how steady you are holding your device. Assign the volume buttons to control zoom or exposure. You can also assign gestures (e.g. swipe left) to program the ultimate camera! Clap, whistle or make a loud noise to take a snap, perfect for group shots. Live RGB / luma histograms, multiple composition grid overlays and crop options. Use our unique UI builder to display only the buttons you want in the order that works best for you! Add over 100 live effects to your photos in the viewfinder or add them later in post-processing. Add a famous 'buddy' or two to your shot. You can change the size and position of the each buddy or remove them later. Powerful set of post-production tools that let you crop, rotate add borders or create a retro look with just one click. * Certain features like RAW, manual shutter speed, ISO and focus distance will depend on hardware support of your device.